Research across animal species suggests that eye gaze plays an important role in dominance/submission interactions. In a confrontation, maintenance of eye contact may indicate a struggle for dominance whereas gaze aversion suggests a withdrawal from conflict. Past research has focused on measuring eye gaze patterns in various contexts. The current experiment directly manipulated eye gaze patterns toward versus away from the eyes of angry or non-emotional faces to study the impact on dominance-related self-perceptions and decisions on the ultimatum game. Maintaining eye contact led men to make more dominant choices on the ultimatum game. Maintaining eye contact with angry faces in particular caused an increase in self-perceptions of aggression, and self-perceptions of aggression predicted more dominant responses on the ultimatum game. Women also reported an increase in self-perceptions of aggression after maintaining eye contact with angry faces, but they did not behave in a more dominant fashion on the ultimatum game after maintaining direct eye contact with faces. 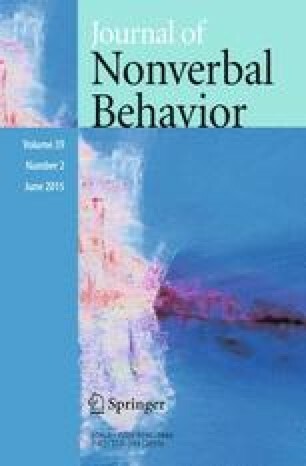 These results suggest that eye gaze behavior can exert a causal influence on dominance-related responding.